I haven’t written a book review since April. That seems bizarre but there it is. I had a lovely little break but am now left with a problem: I may have stopped reviewing in May but I certainly did not stop reading and I have a terrifying number of books I now find myself wanting to review. Knowing the number of hours it takes to write the average review, this is overwhelming enough to make me want to take June off too but that would accomplish nothing. Instead, I shall attempt to ease myself back into my old blogging habits by presenting you with a selection of quotes cleverly disguised as a review. 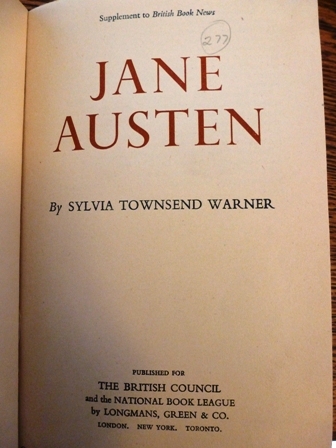 Jane Austen by Sylvia Townsend Warner is a slim pamphlet (only 29 pages) and if Simon hadn’t read it earlier this year, I would never have known it existed. In fact, when I went to pick it up from the university library it was so slim (even bound) that it had slipped between its two much larger neighbours and I almost didn’t find it. But I am so pleased that I did. It is always fascinating to read one author’s analysis of another’s work and when it happens to be Sylvia Townsend Warner (STW) discussing Jane Austen, it is pure delight. STW is so confident in her judgements and I adore that about her; there is nothing worse than analysis tempered with apologies. She loves Austen’s works and is able to very clearly articulate both what she views as Austen’s success and her failures. Indeed, he is at odds with the rest of the book, for he is the only character where the author falters in her worldly wisdom. Young persons who have recently come of age see mankind divided into three groups: those younger than themselves, who are children; those over thirty, who are elderly; those between twenty and thirty, who are grown up. An older author would have remembered to make Darcy more perceptibly a young man, whose shyness and youthful censoriousness are in alarmed revolt at a society to which he is not accustomed. Of all Jane Austen`s novels, Emma most fully conveys the exhilaration of a happy writer. As the arabesques of the plot curl more intricately, as the characters emerge and display themselves, and say the very things they would naturally say, the reader – better still, the re-reader – feels a collaborating glow. Above all, it excels in dialogue: not only in such tours de force as Miss Bates being grateful for apples, Mrs Elton establishing her importance when she pays her call at Hartfield, but in the management of dialogue to reveal the unsaid; as when Mr John Knightley`s short-tempered good sense insinuates a comparison with his brother`s drier wit and deeper tolerance; or as in the conversation between Mr Knightley and Emma about Frank Churchill, whom neither of them then know except by repute: Emma is sure he will be all that he should be, Mr Knightley`s best expectation is `well grown and good-looking, with smooth, plausible manners`- and by the time they have done, it is plain that Emma is not prepared to fall in love with Frank Churchill, and that Mr Knightley has been, for a long time, deeply and uncomfortably in love with Emma. I think that last phrase – “deeply and uncomfortably in love” – is particularly perfect. 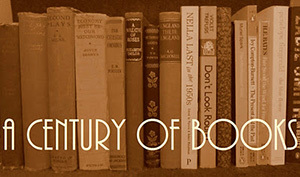 …the twenty years that had gone by since Pride and Prejudice had brought many changes, notably in what was expected on women. Under the growing influence of the Evangelical religious revival, women lost much of their liberty of speech and of action: they could assert themselves less; on the other hand they were allowed to feel more. In Emma, Jane Austen chose a heroine who no one would much like but herself. In Persuasion, the novel that followed, she complied with the taste of a new generation. Jane Austen writes of Anne Elliot with a solicitude not called out by any of her other characters. They fall into their scrapes and misfortunes, and their uncomfortable remorses are described with a pardoning understanding, but without much change of voice. In the case of Anne Elliot – whose only fault has been a submissiveness which by new standards of female behaviour was praiseworthy, not blameworthy – there is a degree of sympathy that almost amounts to special pleading. This makes Persuasion both the most compelling and the weakest of Jane Austen`s novels. Every stage of Anne Elliot`s transition from resignation to fortitude, and every detail of her relations with Frederick Wentworth, is registered as though with Anne`s own sensibility: elsewhere the narrative is thin and almost perfunctory. Mrs Clay, and Lady Russell, and both the Walter Elliots, and the barefacedly expedient Mrs Smith are shadowy figures. One sees them, in fact, through Anne`s eyes. They do not hold her attention, and they do not hold ours. I am still not sure if I agree with STW or not on every point but she has definitely provided food for thought. I do absolutely agree about the indifference with which the secondary characters are treated; there are so many wonderful characters – the Crofts, Lady Russell, and certainly Mrs Smith – waiting to be brought to life the way Austen did so wonderfully with her supporting casts in Mansfield Park and Emma and every time I read Persuasion I am frustrated by their wasted potential. STW is very comfortable with her subject and intimately acquainted with Austen’s works, and that familiarity comes across in her writing. These are not the much laboured-over, emotionless thoughts of an argumentative reviewer but the unusually coherent musings of an intelligent and articulate Janeite. I had a delightful time reading this and my only complaint is that it was far too short! I share your complaint from the last line! It is such a wonderful little pamphlet, and I’m delighted that you’ve read it. If only she had done a longer book! But I’m glad she didn’t get bogged down with biographical detail. I still think Elinor & Col. Brandon would have made a wonderful match – she deserved better! I’m very intrigued by the comment on Mr Darcy, I need to think about that some more, and maybe look for this booklet. Ah, but it is hard to find. In the looking, though, it appears that the library in the “next town over” has quite a bit of STW (while my own has nary a title), so I hope to get down there this summer and investigate this author that I’ve heard so much about. Nice review – thanks for sharing it with us. Good to see you back reviewing, Claire, and this one read much like a lively conversation over a latte on a pleasant afternoon. Isn’t it amazing that 29 pages could stir up so much thought? Love it. Persuasion is the weakest of Austen’s texts?! I never heard such blasphemous nonsense in my life!!! I adore Persuasion. It showcases Austen’s growing maturity as a writer. For that reason alone it is priceless. I’ll refrain from bogging down the comments with effusive ramblings of its many merits. I love the commentary on Emma. I keep hearing talk of Emma on the blogosphere that has made me eager for a reread. I like that it was described as possessing a certain glow. I think that word describes the novel perfectly. Its glow never fails to make me feel warm and cosy on the inside. It’s literary sunshine.